The Magazines Canada Retailer of the Year Award recognizes the importance of good stores in the Canadian magazine landscape. It is awarded annually to an outstanding Magazines Canada retailer who actively cultivates the connection between consumers and Canadian magazines. Magazines Canada is pleased to announce that Toronto’s Presse Internationale, Bloor Street is the Magazines Canada Retailer of the Year for 2016! Since August 24, 2005, this magazine superstore has been run by husband and wife team Huashan Liu and Qing Yang. The store is a franchise of the once powerful Presse Internationale chain, which at its peak had four stores in Toronto and another in Ottawa. Now two remain (the other is in Toronto’s Beaches neighbourhood). Presse Internationale and the convenience store model (with cigarettes, soft drinks, phone cards and lottery) that devotes the bulk of its energy—and space—to French and English press, is one of the last of its kind in Toronto. Good stores adapt and Presse Internationale is no different, recently adding a white pull-down screen and offering passport photos. But it’s a big magazine store at heart. Presse Internationale is located just east of Bathurst Street in Toronto’s Annex neighbourhood, a part of town that not long ago seemed the centre of the Toronto literary community. The neighbourhood feels a little different today, but it is still home to students and professors, filmmakers and CBCers, writers and musicians. It’s still the strip with the Hot Docs Cinema and Presse Internationale. The neighbourhood that Jane Jacobs and Stuart McLean called home. When asked about the changes and how it has affected business, Ms. Yang had a surprising observation: “We noticed we started selling more French [titles] after Maison de la Presse closed.” This shop was in Yorkville, a few miles down Bloor Street, but it speaks to the value of a neat shop with a deep inventory. These days, with big stores fewer and farther between, the customers will travel to find you. Presse Internationale carries all 200 Magazines Canada titles. The front window is modest, but there have been Canadian titles in all nine pockets for the past few years. 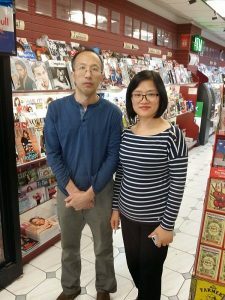 Magazines Canada’s retail accounts manager Chris Chambers visited the store to let them know they were being named Retailer of the Year, but had to return in the early evening to catch both Liu and Yang in the shop: Ms. Yang works the dayshift (10am–6pm) and husband Mr. Liu the nights (4pm–midnight). A woman browsing overheard the conversation—”I love this place and I love magazines. I should be their customer of the year.” She even got a small smile out of Mr. Liu. Congratulations to Presse Internationale, Bloor Street from all of us at Magazines Canada! Magazines Canada recognizes the critical role retailers play in the Canadian magazine landscape. Our annual Retailer of the Year Award is just one of the ways we celebrate and congratulate you, the retailer, for your partnership. Research confirms time and again that Canadians will buy Canadian magazines when they can find them and retailers are, of course, an integral part in cultivating this connection between readers and magazines. Outstanding retailers not only facilitate the relationship between consumers and their magazines by making quality Canadian titles readily available to the public, but they also know their customers, are willing to try new magazines on their shelves and maintain a steady supply of those trusted, established titles. The Retailer of the Year is a visionary, a connoisseur and a vital link in Canada’s vibrant magazine industry. Active participant in Newsstand Marketing Program and/or shows support by using promotional materials: signage, backer cards, stickers/decals, etc. All nominating is done internally by Magazines Canada Distribution Staff. MC Distribution staff will produce a short list of retailers who they feel are worthy of the Retailer of the Year honour according to the listed criteria. Staff will discuss their relationship with the retailers and refine their list of worthy candidates until a clear winner is chosen. All decisions are final. The Retailer of the Year Award is announced and presented at MagNet, Canada’s Magazine Conference, in April.